30 Hard Capsules + 30 Soft Capsules! 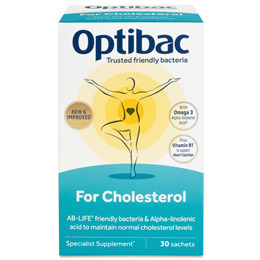 OptiBac Probiotics For your cholesterol is a natural supplement with live cultures and omega 3 especially to help you maintain normal cholesterol levels. This extensively researched supplement is safe to take on an ongoing basis and is free from side effects associated with cholesterol lowering medication. This natural supplement, especially for those concerned about their cholesterol levels, contains two different types of capsules - hard capsules with live cultures and soft capsules with Omega 3. Lactobacillus plantarum AB-LIFE is a blend of high quality natural bacteria and Alpha-Linolenic acid (an Omega 3 essential fatty acid) helps to maintain healthy cholesterol levels. OptiBac Probiotics Omega 3 is Alpha-linolenic acid (ALA), cold pressed from flax seeds. ALA is a type of unsaturated, essential Omega 3 fatty acid, which is important for the healthy functioning of the body. Where as it is advisable to reduce the intake of saturated fats in our diet, it is recognised that certain unsaturated fats, such as ALA, are beneficial to health. In fact, the body does not have the ability to produce essential fatty acids, so they must be taken as part of one`s diet. Filler: maltodextrin; `AB-LIFE®` Live cultures: (Lactobacillus plantarum CECT 7527, Lactobacillus plantarum CECT 7528, Lactobacillus plantarum CECT 7529); vegetarian capsule: hypromellose, titanium dioxide; anti-caking agent: silicon dioxide. Take one hard capsule and one soft capsule per day with food, preferably with breakfast, or as professionally directed. For best results, take daily for at least three months, OptiBac Probiotics For your cholesterol may be used on an ongoing basis and can be taken alongside statins, or other cholesterol lowering medication. Do not exceed recommended daily dosage. Food supplements should not be used as a substitute for a healthy diet and lifestyle. The beneficial effect is obtained with a daily intake of 2g Alpha Linolenic acid as part of a balanced diet. Check side of pack for Best Before Date. Below are reviews of OptiBac Probiotics For Cholesterol - 30 + 30 Capsules by bodykind customers. If you have tried this product we'd love to hear what you think so please leave a review. Have been taking these and other products to try to help my cholesterol as statins do not suit me. I have not been taking them long so have not had a check on it. 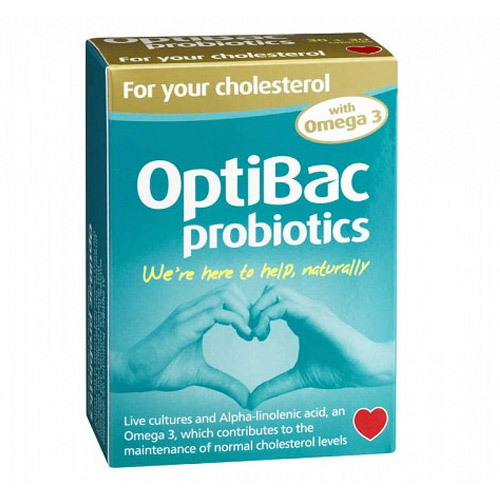 OptiBac Probiotics For your cholesterol is a natural supplement with live cultures and omega 3 especially to help you maintain normal cholesterol levels. This supplement is safe to take on an ongoing basis and is free from side effects.